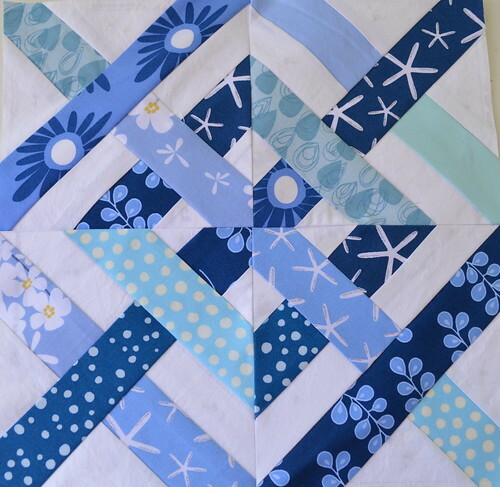 Remember that paper pieced block for do. Good Stitches that ended up being 15" instead of 12.5"? I finally got the pieces to print to size and made my two blocks. For the November block in our Joy Circle of do. Good Stitches, we used this tutorial to make a caned seat block. I will say by the third one, I really had it down! This should make a really lovely quilt for someone in need of a little TLC. Unfortunately that would not be the end of my giant block size issues this month. 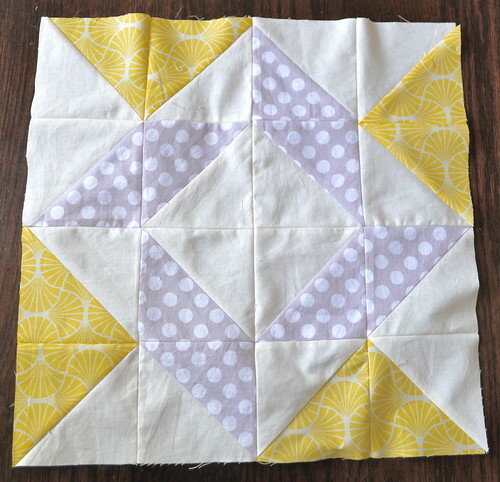 I bought these awesome triangles on a roll at fatquartershop.com and decided to give them a try for our Balkan Puzzle for block of the month at Charlotte Modern Quilt Guild. There are 4 Half Square Triangles across the side that needs to be 12.5", so I figured each block should be 3.5" with seam allowances. I chose the paper for a 3.5" finished HST, assuming the finished was when you sew the two triangles together. 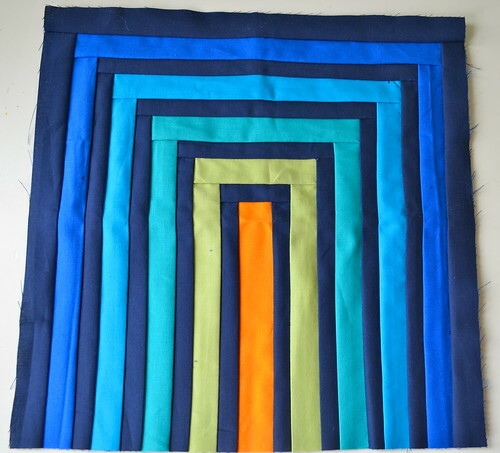 No the finish is when you have sewn that block to the other blocks, so my blocks were really 4" which made a 14" block. UGH!!!! 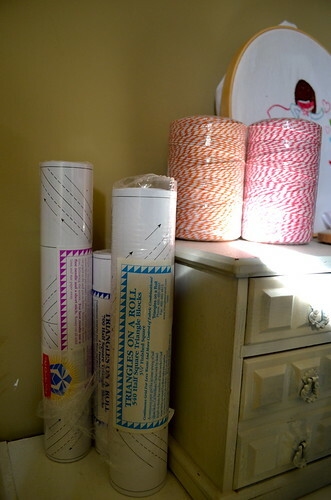 Now that we are speaking the same language, I am loving my triangles on a roll. I just wish I had bought some different sizes. In the only block that seemed to go right this month (or so I hope! 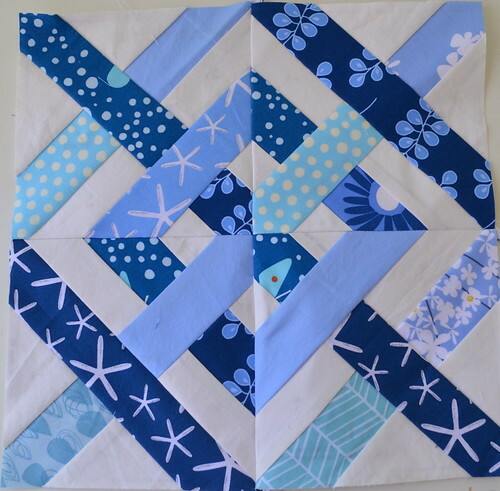 ), this is my November block for the Sewn Together Bee. Considering Flaun printed us the template from the Modern Blocks book, it was hard to mess up! So, now I just need to make another yellow + gray Balkan Puzzle block and I'll be all caught up! That's a good thing because I have a lot for you next week. I'm taking place in two blog hops and will have a tutorial for you in each one. On Tuesday I'll be joining Elaine for her Happy Little Pouch Hop! And, on Wednesday I'll be at Ellison Lane for the Deck the Halls Blog Hop! Yay for the HLPH next week! I love your bee blocks! I can't imagine how you keep up - I'm in one be and that's enough for me to keep on top of!